Conventional wisdom claims everyone is online and no one can survive without a connection. The drive to digital lifestyles is seemingly unstoppable and inevitable. However, the facts do not support this conclusion. A surprisingly large and stable sector of Americans is quite content to be offline. A recent Pew Research survey found that some 15 percent of Americans do not use the Internet on any device and another nine percent use it only at their workplaces. A surprising 92 percent of these offline adults are quite content to remain unconnected. This rejection of the online world is not limited to older people. While older people are more likely to be offline, the youngest polled adults (age 18-29) listed 13 percent of the group without an online connection. Some of the nonuser even live together with others who are connected while others were seasoned Internet users before giving it up. The poll does not support the conclusion that use of the Internet is necessarily harmful. People can and often must use it for all sorts of reasons. However, the poll does say that there is life beyond the Internet. People can and do exercise the option of staying offline. The frantic perception of “everyone is doing it” that fuels an economy of frenetic intemperance can be opposed by simply pulling the plug. 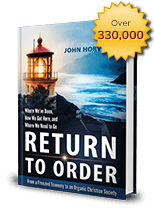 This entry was posted in Featured and tagged America, Christian civilization, consumption, economic crisis, false happiness, Family, financial speculation, frenetic intemperance, honor, Institutions, Nobility of purpose, Return to Order by John Horvat II. Bookmark the permalink.